some fitness goals – here goes nothing! You know me. Always making goals. I’ve been workin’ on my fitness these past couple months and finally to the point I feel I need real structure again as I’m in the exercise habit! (getting to the gym regularly was a general goal that worked for me – just get there. HA!). So posting for the world to see, my weekly workout schedule. This is what I’ll be working with through November. I plan to change it up for each new month. This is roughly what I’ve been doing for the last 2 months with a little less cardio. If anyone’s wondering about my fitness facility access, I am SUPER DUPER spoiled with options. I work in a building with a little gym right down the hall (good for lunchtime workouts), and work on an Air Force base with 3 different gyms, 2 outdoor and 2 indoor running tracks, and a pool. The gym use and *most* of the classes there are free (the ones that I do are) for my use. I’ve been doing the yoga class for 6 months or longer, twice a week, and I can’t imagine life without yoga now! As for my home workouts, I live in a safe, flat neighborhood but it’s unlit at night, so that’s a factor for winter running as is the iciness! (so I’ll be utilizing the indoor tracks on base). I have space at home for most floor workouts and free weights but no other gym equipment. November: above. Still getting used to exercise so trying to keep it fun and diverse while upping my cardio. How’s everyone getting their fitness on? Love that motto! I saw it on Pinterest recently and fell I love with it. 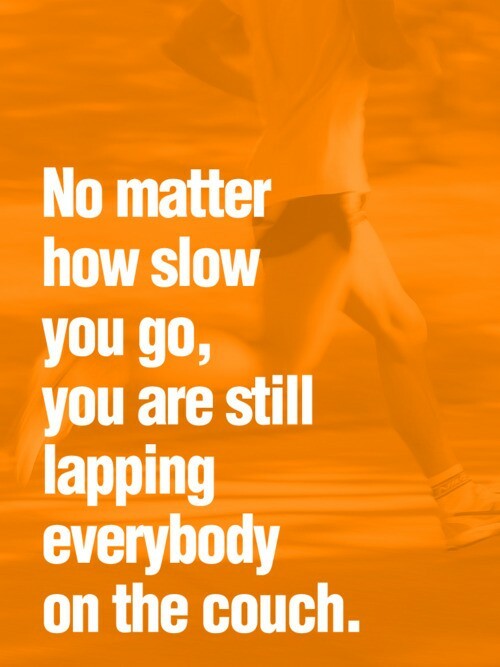 It’s such a good reminder for a slowpoke like me. Previous Previous post: when soundtracks were good. Next Next post: little things.